Emily Bleeker is a former educator who discovered her passion for writing after introducing a writer’s workshop to her students. She soon found a whole world of characters and stories living inside of her mind. It took a battle with a rare form of cancer to give her the courage to share that amazing world with others. Emily lives in suburban Chicago with her husband and four kids. Between writing and being a mom, she attempts to learn guitar, sings along to the radio (loudly), and embraces her newfound addiction to running. Connect with her or request a Skype visit with your book club at emilybleeker.wordpress.com. 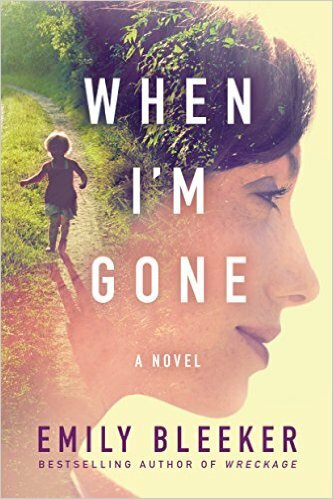 I wasn’t expecting a book about a widower experiencing the recent loss of his wife to cancer to be so witty and engaging, but Emily Bleeker surprised me with When I’m Gone, and pleasantly so. Luke is the grieving husband, whom we first meet as he and his children are returning from his wife’s funeral. He’s not a perfect man, by any means, but he is a fundamentally good, and good-intentioned man, and as we see more of him, we see him working hard to be a good father to his kids, and to honor his wife’s memory. Natalie, Luke’s wife, we meet only through letters, letters that Luke begins receiving on the day of her burial. I’m not going to tell you how Natalie works her magic, but I will say that through her letters, we meet a woman who, like her husband is both real and flawed, and full of good intentions. She’s also funny, kind, and genuinely interesting. Honestly, I’d want her to be my best friend. With both of these two characters at the core of her story, Emily Bleeker spins us a tale that is at once full of hope and full of – not quite sadness, but definitely poignance. Her dialogue never feels stilted, even when she’s writing for young children (probably her history as an educator helped with that, or she just has a good ear) and I love that she managed to give us a frank and open look at a woman going through chemo without ever once letting things get maudlin. Of course, Natalie’s letters serve a greater purpose than just the afterlife-equivalent of “Hello from heaven. Having a wonderful time. Wish you were here.” They are also meant to help Luke learn a few family secrets – some of which are as simple as “make sure you use my pancake recipe, here it is” and some that are much more complicated and span decades of family history. Still at the end of the novel, we are left smiling but with tears in our eyes, and while some of that is reaction to the story, and some is a reaction to the fact that this book is a fairly fast read, just because it’s so naturally written, some of it is also because Bleeker’s characters are so dimensional and engaging we cannot imagine that their story is over. There wasn’t enough time. But that’s sort of the point, really. Goes well with pancakes with butter and real maple syrup, crispy thick-cut bacon, fresh blueberries, and coffee.